Stay informed about The Revival. Get an email about important events, information when a new issue is launched. In protest of Israeli savagery in Palestine, multiple protests have been organised all over UK starting at 12pm. In Manchester there is a protest at Picadilly gardens starting at 12 noon, moving to and joining other protests at Media City at 3pm. Given how the BBC has over the past fwe days acted like occupied territory simply spewing zionist propaganda instead of providing any semblance of balance, we need the BBC to hear our voices, so it is important for everyone to join the protests and make their voices heard outside the BBC at Media City. 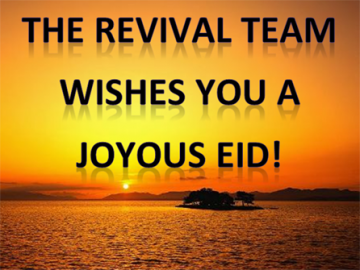 A new belated Eid Mubarak from The Revival - Issue 20 Out Now! Eid Mubarak to all our readers new and old. Inshallah this blessed month of Ramadan has passed by bringing all its benefits to all of us. Read more about A new belated Eid Mubarak from The Revival - Issue 20 Out Now!